A nice close up of the bow in action. The bow is stained to look like Yew. Notice the excellent bend of the bow, including through the handle section. Showing the bowyers mark and arrow pass mark. Cow horn nock. At an extra cost!!! Medieval style Longbow Made from Lemonwood and Bamboo for reliability and performance. The bow works through the handle and is made to "come round compass" the handle is left bare but with the arrow pass marked with the Bowyers mark. 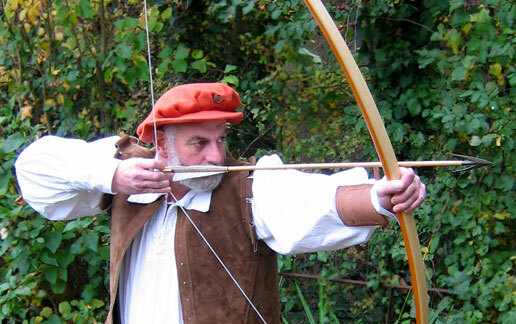 The bow is fitted with simple horn nocks, a string and comes with a protective bag. Just give us a call to place an order on 01225 790452 mon-sat 9am-6pm.